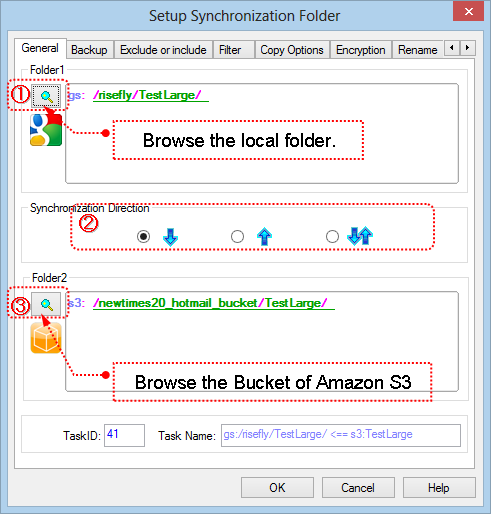 Amazon S3 Synchronization, and beyond..
How to setup a task to synchronize with Amazon S3 bucket? 3. 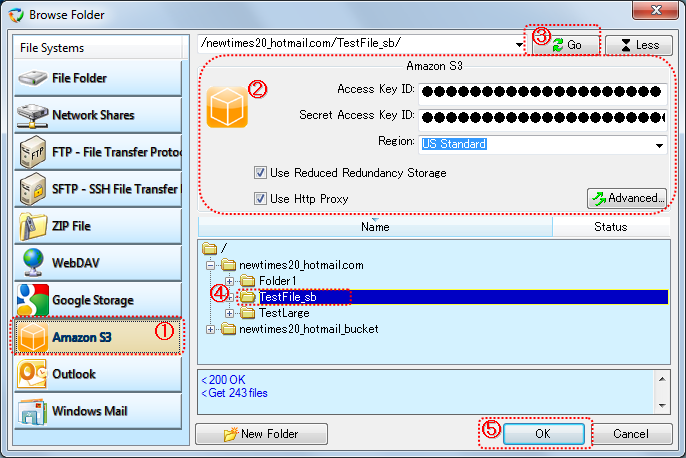 Click to show the "Browse Folder" dialogbox to select the Bucket of Amazon S3 into the "Folder2" edit box. (1). Select "Amazon S3" in the "File System" list. (2). Setup the parameters for connecting to the Amazon S3 server. Input "Access Key ID" (20 characters, like "AKIAXXXXXXXXXXXXTAUA". Input "Secret Access Key ID" (40 characters, like "TmAi+xxxxxxXXXXXXXw/xxxxx/xxxxXXXXXXXFx9". If http proxy is necessary in your network environment, please check "Use http proxy", HTTP proxy option dialog box is shown, you can setup the HTTP proxy settings in the dialog box. If you need to set some customized meta data to the file after upload it to Amazon S3, press "Advanced" button to set the meta values. (3). After setup the connection parameters, press "Go" button to connect to the Amazon S3, the browser begins to list the folders into the tree view. The log window below the treeview logs all the commands sent to the server, and responses from the server. If the connection between BestSync and server can not be established successfully, please check the log.